For the curious (see Restoring the Joy of Learning (with Gene Stead), the Internet is available to level the playing field for learning. Basically, with the Internet, we all have access to the mostly all the information a Nobel Prize winner would find. For me, my reserach productivity is directly related to my curiosity and my curiosity and thinking is fueled by gathering the thoughts and data from others and rearranging them into new and potentially interesting patterns. Google and the Internet provide a new dimension for chasing my curiosity. Google enables "just-in-time" learning for me, which is preferable to my formal university "just-in-case" memory-driven learning. When I see something I don't understand, I ask Google and I ask the viewers of my web page. I always seem to get timely answers. So for me, as an "educator" I realize that I am no longer an educator but a co-learner with the all of you. Web pages such as these, Blogs etc, provide ways for us to tell stories that are hopefully interesting. Moreover, as soon as Google crawls these pages, they are readily found by anyone in the world. 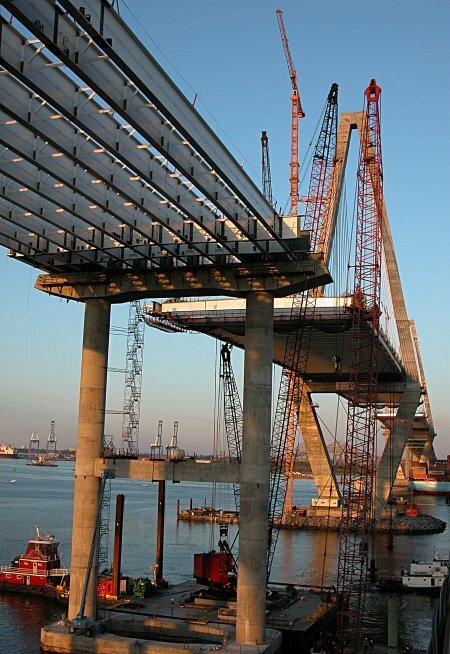 This is a short essay about me, curiosity, looking and seeing, the Internet, open access to information and the community associated with actually building the Cooper River Bridge (Palmetto Bridge Constructors, SCDOT, High Steel Structures, Freyssinet and many many others). 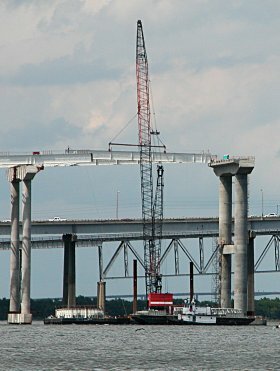 The story around the tug and crane photo below is a good example of looking but not seeing. I took the below photo in the morning along with the other photos of the pylons and cable stays June 27 see the "details" page. 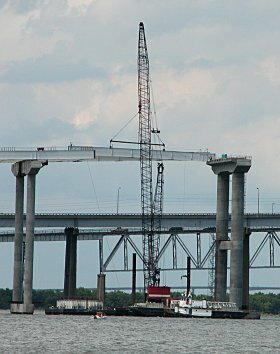 While riding my bicycle from one vantage point to another, I noticed the tug, pushing a crane around. I made a few photos but did not understand their significance, so the below photo did not make the first draft of today's essay. 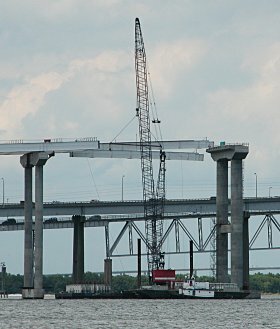 By mid afternoon, I returned to the Aquarium to photograph the entire bridge (above) and noticed that they were placing steel girders on the western approach (see left blur of a steel beam hanging from the crane). 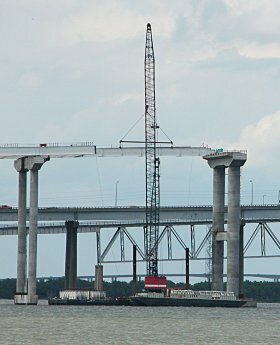 So I made a few photos of the crane hoisting the steel beams and placing them (see below). 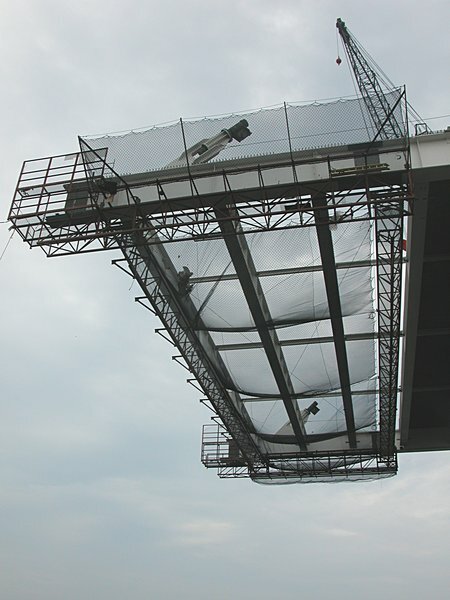 I updated the web page and sent Bill Mankin (part of the fabrication team at High Steel Structures) the link. 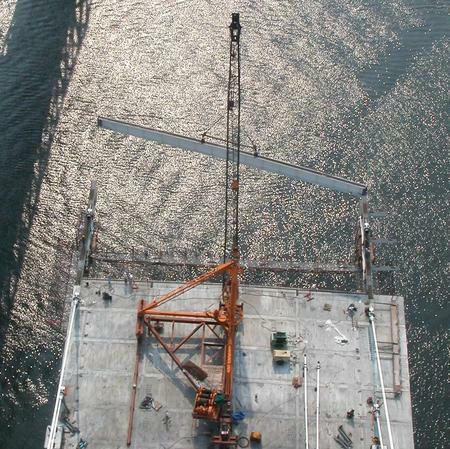 He replied that if I looked carefully at the barge at the base of the below photos you could see the steel and cross members. I looked and sure enough, there they were. 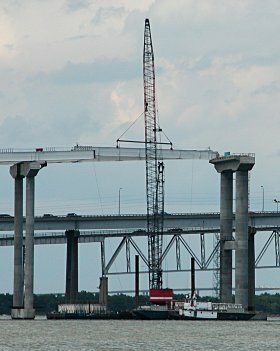 I suddenly remembered that in the morning batch of photos, I had taken a photo of a tug pushing a crane somewhere. 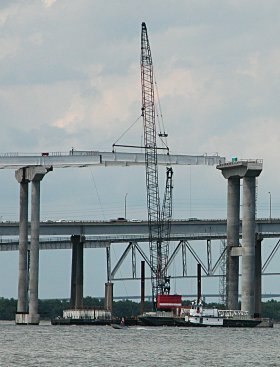 I returned to this photo after reading Bill's email and noted that not only had I photographed the tug, crane and barge, but there were several other barges in the backgound with the steel beams and cross members. So here is that photo - below my digression. (A note about these bridge pages, the Internet and community. I was fortunate to be part of the early UNIX community (1975 - ) at Duke where we experienced the value of open exchange of information, ideas and insights via computer network connections. We started by exchanging seminar notices with UNC and over time, more was exchanged than notices. A new community arose from those connected to the computer network, a network which grew to become USENET - started by Jim Ellis and Tom Truscot at Duke and Steve Bellovin at UNC. For many person-to-person interactions, our computer network reduced geographical limitations to zero and new communities arose and network-centric collaboration became an informal and a continuously available way for dealing with the day's activities. We realized that something dramatic was changing - and that we were part of a major paradigm shift in collaboration, problem solving, communication and education. 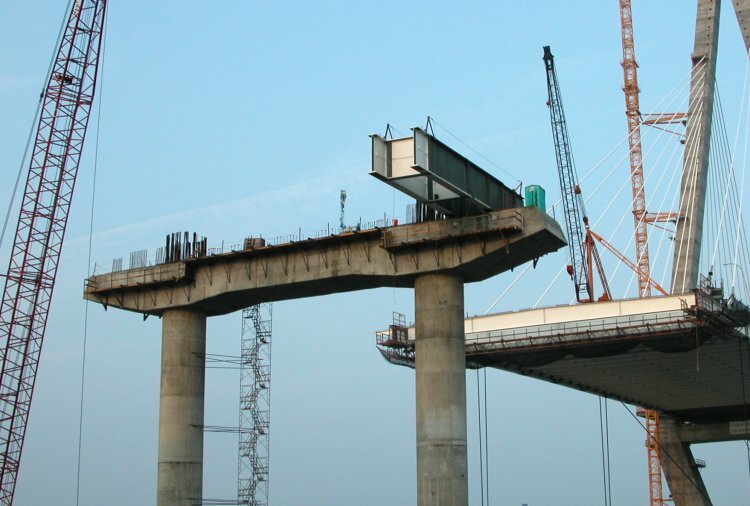 What does open source have to do with the bridge photos? 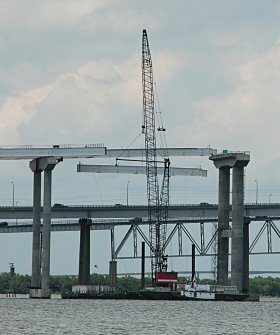 It seems to me that these photos have become an open library for those interested in tracking the construction progress of the new Cooper River Bridge. Moreover, these pages have become a tool for spontaneous learning and exchanging ideas. Preparing these photos each Sunday started as a project for my grandchildren. 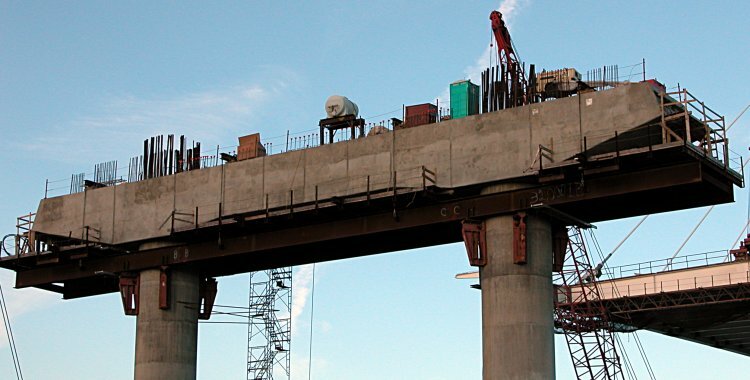 From time to time,people sent email commenting about various aspects of the bridge, the engineering and its construction. 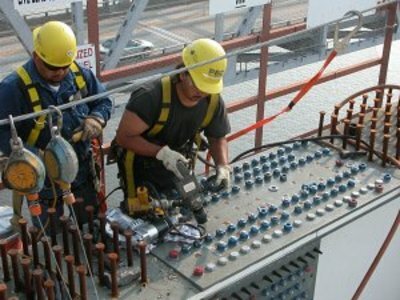 The folks at High Steel communicated with me and provided additional information. 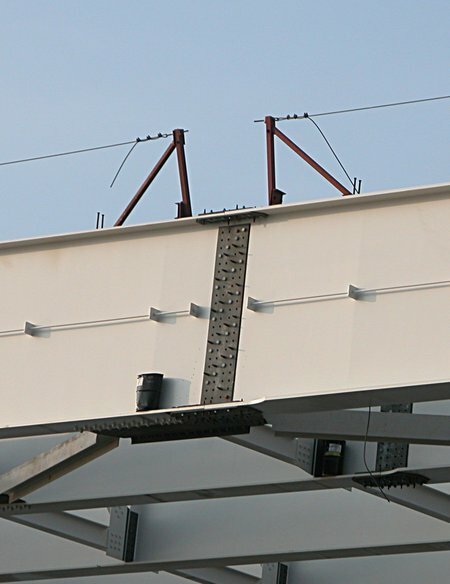 This started a conversation with several engineers who provide me much better insights into what I am photographing. Sharing the photos by the Internet thus evolved from a one-way show-and-tell into a two way conversation, exchanging my images with engineering and personal insights from members of our informal community. 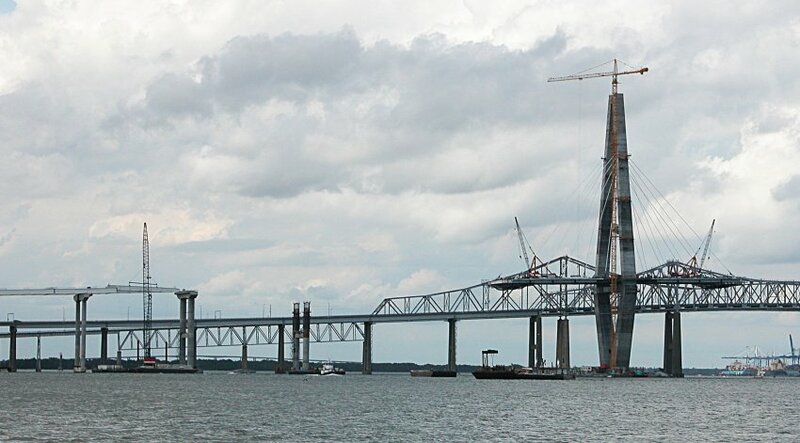 As an educator, I found the bridge photos evolving into a learning resource, with learners coming from a boundaryless community of curious folks - a university or engineering laboratory without walls. These experiences are very useful lessons for building learning opportunities for students here at MUSC. I really enjoy this interactions with folks in our new community that have taken the time to help me. With respect to the below photos, Bill's note reminded me that I saw what I was looking for and failed to see something much more interesting. This is a typical example of how the community of Internet users use web-asscessible resources to build new communities of folks with intersecting interests ). 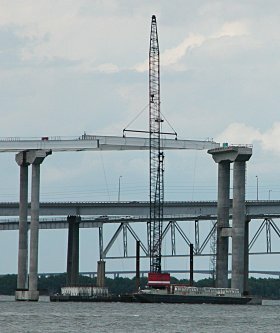 The suspended beam which I saw and the barges with beams and cross members underneath the beam which I did not see (click on the image to see the other barges). 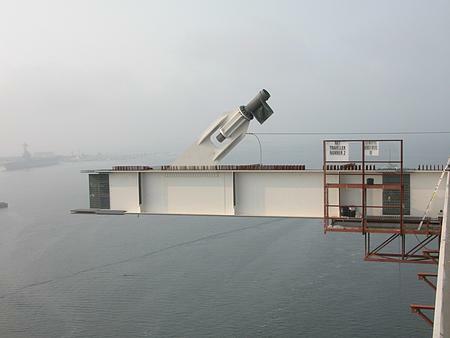 Final placement of the beam, lowering the left end. 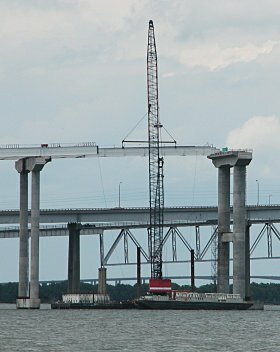 Note the workman (right most photo) standing between the green port-a-potty and the beam (click to see the full image). 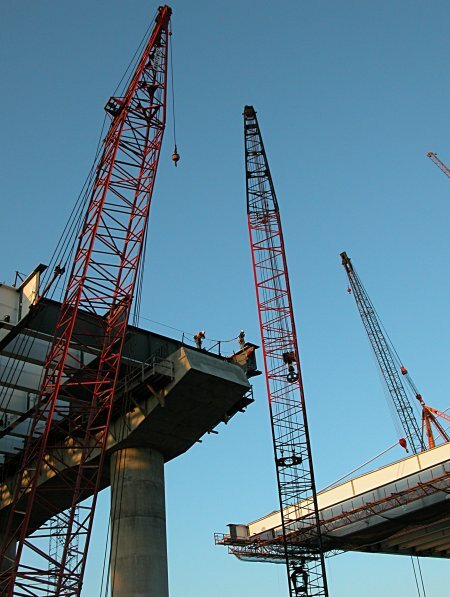 when the girder is lifted the girder is either level or on the slope of the roadway. then you shouldn't make the lift. (ironworkers on the top of the piers) then they control the signals and the girder. some thing to "rest on "while I worked the web plate around. 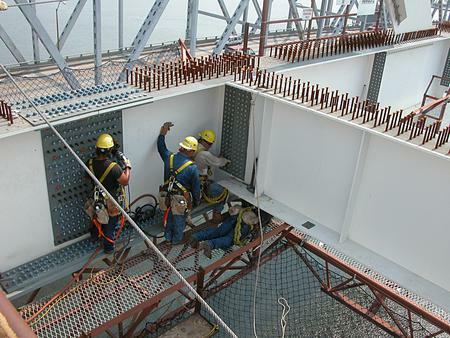 the girder but you get used to that after a while and learn where not to put you hands and fingers. 7. 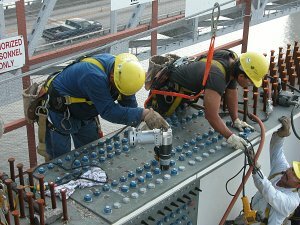 Once you have the plates back in line you can wrench tight the bolts already in to get the girder and splice plates close. same dia. as the hole) . Start sticking bolts and you are home free. entered in to the splices." working in the "raising gang" that I think I deserve a cold one. And I agree - the cold ones are on me! 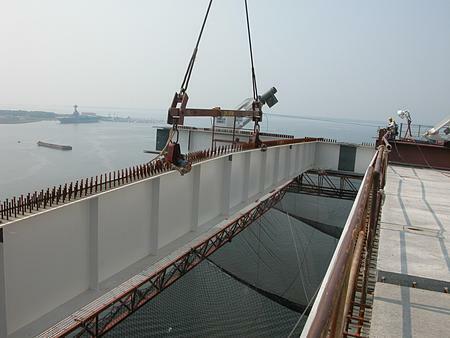 "Notice that on the barge there are several (brownish) vertical columns that can be seen between the crane. 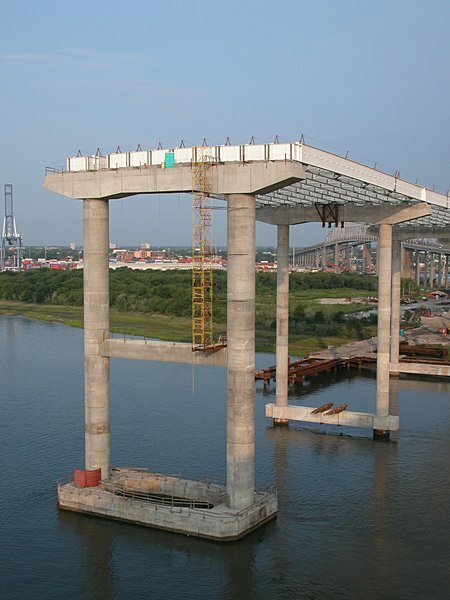 These are known as "spuds" and are steel columns that extend through the barge and into the river bed. 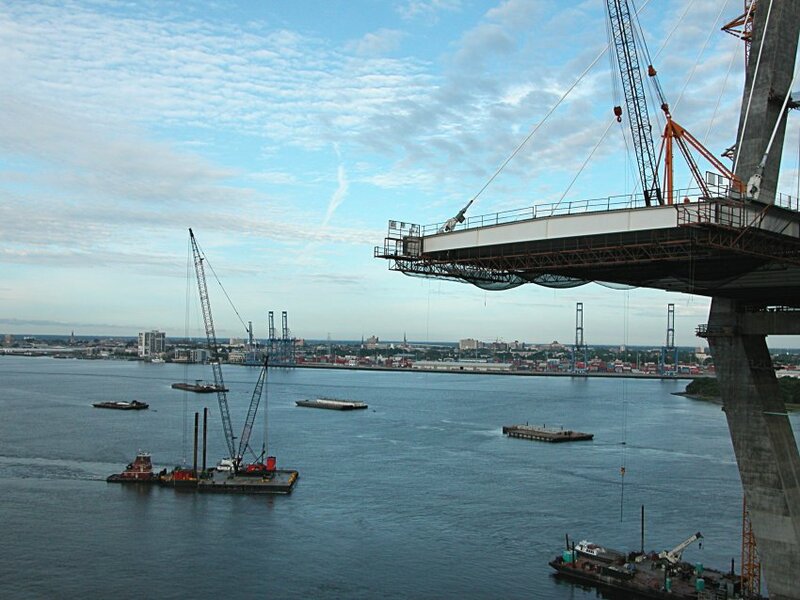 They essentially anchor the barge in place. The number and placement depends on the river channel conditions - but there are typically four spuds for larger projects. 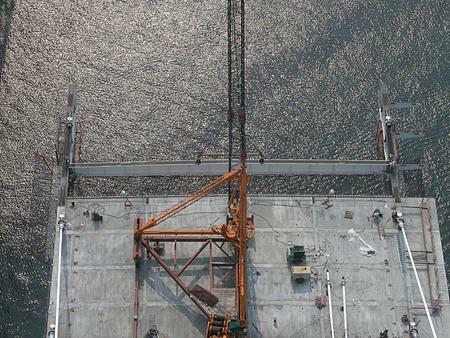 In some instances, I have seen where the spuds actually jack up the barge itself - making a temporary platform. 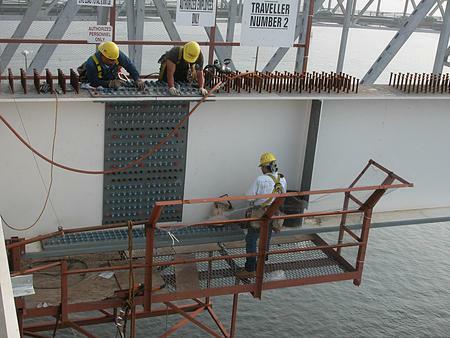 On the Mississippi River, sometimes you have to also add long cables and "anchor weights" to the barge. This is because the current may create a condition known as "scour" at the spud (the higher currents cause form vortices around these spuds, eroding out the channel bed and undermining the temporary foundation. You can experience "scour" yourself the next time your go to the beach, stand in the surf, and feel the waves remove the sand from beneath your feet and toes). [Note: this "scour" effect and the presence of shipping traffic is one reason there are those rock islands surrounding the towers.] While this is not an "official" answer, it seems to describe what is occurring in your photograph." 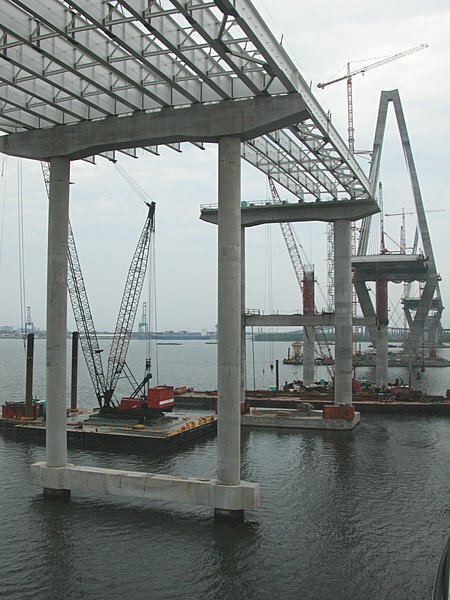 July 4, 2004 - placement of the steel beams and cross members is complete so the next question: How are the beams positioned in order to splice them with their predecessors? - For orientation - note the green porta-potty on the transverse beam (left photo), and compare with porta-potty from last week.